Dr. James Goldgeier, Dean of American University’s School of International Service, is a professor of political science and international relations as well as an award-winning author or co-author of four books, including Power and Purpose: U.S. Policy toward Russia after the Cold War (with Michael McFaul) and America Between the Wars: From 11/9 to 9/11 (with Derek Chollet). 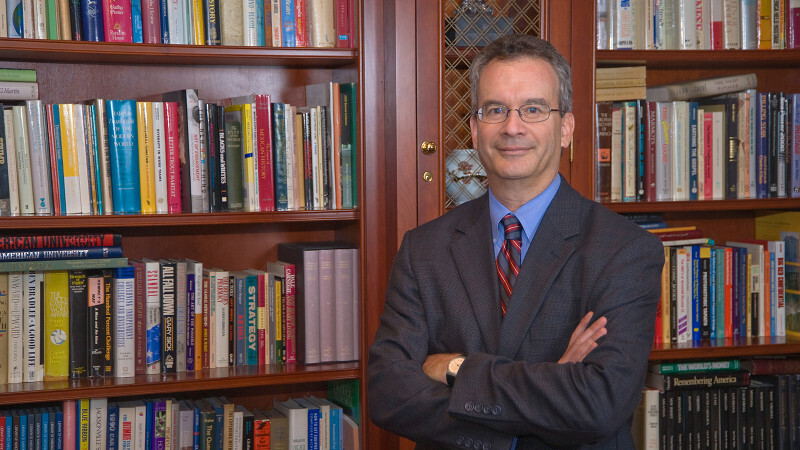 Dr. Goldgeier’s work is widely recognized and respected in the international community, and he has held the Whitney Shepardson fellowship at the Council on Foreign Relations and the Henry Kissinger chair in foreign policy and international relations at the Library of Congress, among other appointments. The Diplomatic Courier sought out Dr. Goldgeier’s expertise on the future of NATO, transatlantic relations, and the future of the global balance of power. DC: What has changed for SIS in the past ten years? JG: SIS is fairly unique in the breadth of its multidisciplinarity and interdisciplinarity. I am a political scientist studying international relations, and the field of international relations has largely been dominated by political scientists. But today, the number of different disciplines that are represented in the world is increasingly complex, and solutions to problems are only going to come from people working across multiple disciplines. So in addition to political scientists, our faculty includes sociologists, geographers, economists, people who are trained in areas like energy and environment, demographers, and psychologists. It is that ability to put together a group of people approaching international problems from so many different angles that makes us unique. We are not dependent on particular disciplines from traditional departments, and I think the field of international affairs – because of the kinds of problems we face on environment, public health, cross-cultural communication, and immigration issues – needs these different disciplines represented and interacting. We can really, as a school, demonstrate the importance of this interdisciplinary, multidisciplinary work, and that will help lead the way for how people think about international affairs differently. DC: Some have suggested that NATO’s intervention in Libya denotes that the alliance is outdated and near defunct. Others have said that the Libyan mission has reinvigorated the organization’s mission and utility. What is your view on NATO’s performance since the collapse of the Berlin Wall, and what do you see in the organization’s future? JG: There have been lots of predictions over the last twenty years about the end of NATO. But the organization today is a lot bigger than it was when the Cold War ended, and it is more active than it ever was during the Cold War. It is an organization that really moved after the Cold War to try to reach out to Central and Eastern Europe to help stabilize that region and bring it into the West. It was important, of course, for those countries to join the European Union as well. NATO has also been trying to deal with its mission. If during the Cold War, the mission was to prevent the Soviet Union from attacking the West, once that rationale disappeared, what would it do? What we have seen is NATO’s role in a number of areas over the past 12 to 13 years, such as protecting the population of Kosovo in 1999. The work really began in earnest in 2004 to 2005 with the international security force in Afghanistan – first peace keeping and facilitating construction of Kabul, and then expanding to really deal with counter-insurgency campaigns. Perhaps the most interesting feature of the NATO campaign in Libya was that the United States stepped back from its traditional leadership role in the alliance and let Britain and France take the lead in pushing forward. For those people who look at all the negatives regarding NATO, I would just say to think about what happened earlier this year. We have this threat of attack on Bengazi by Qaddafi’s forces. The UN Security Council passes a resolution to try to ensure that there would be a response to those Qaddafi efforts, and whom could you ask to do that mission? There was only one institution that could. No matter how much we complain about the number of allies that are able to engage in the mission, the fact remains there was only one group of countries that could have done this mission, and that was NATO. You could argue that NATO really just showed how weak it was by how much trouble it had with this campaign. On the other hand, there is nobody else out there if we really need an organization to do something like the Libya campaign. As it turns out, the support for the rebels resulted in at least the defeat of the Qaddafi forces. Even countries like Norway and Denmark, when involved in these campaigns, are able to do things militarily that other countries around the world are cannot do. DC: Would the expansion of NATO be a good thing then? What about organizations such as the Shanghai Cooperation Organization? JG: My argument over the last five years has been that as NATO takes on more of a role outside of Europe, it does need to partner with other institutions and other countries in order to ensure its legitimacy. It is mainly an American and European institution, and to act outside, it has to have partners. It had some partners in the Arab world in the Libya campaign, and it has many partners in Afghanistan. Partnerships it must develop with other countries, as well as with institutions like the European Union and the United Nations, will be critical for its legitimacy going forward. I think we are going to see NATO make an effort to expand partnerships with countries, for example, in the Pacific region, including Japan, South Korea, Australia, and New Zealand. I think NATO would like to expand its relationship with India, but given India’s history of taking the leadership mantle of the Non-Aligned Movement upon itself, it is hard for India to pursue. Indonesia and Singapore are other countries, and there is also a desire to build up a strategic dialogue with China. European countries are nervous about NATO losing its special character as a transatlantic alliance, which makes forming these country alliances a little difficult. I do not see the Shanghai Cooperation Organization becoming a threat in this regard, but then, I also do not see it developing into an organization that would seek an alliance with NATO. However, I think NATO should be looking for ways to reach out to countries. It has tried to have a relationship with Russia. There is a NATO-Russia council and there’s been an ongoing effort to have a discussion with the Russians concerning missile defense, but the relationship has never developed as many hoped it would. DC: What are the five biggest foreign policy issues that could make or break this year’s elections? JG: I don’t think that foreign policy is going to play a huge role in the campaign – people are overwhelmingly concerned about jobs and the economy. We should think about long-term foreign policy issues that are going to challenge the United States as well as the immediate issues the Obama administration is dealing with. Two major long-term issues facing the United States are climate change’s effect on the planet and balance of power shifts. Climate change is the major existential challenge of the 21st Century. As a country, we are politically not in a good place to deal with this issue, and it will be hard for any single administration to deal with. President Obama has not been able to do what he set out to do when he first came into office. The shift in the balance of the power away from Europe towards Asia has been taking place now over the last 20 years, and it is now clear that this shift is a strategic transformation in world affairs. How the United States responds, especially to the rise of China, is going to have a tremendous impact on American foreign policy. The relationship with China has been in a fairly good shape and continues from the good relationship that the Bush administration developed with China. This is true with respect to India as well. The challenge with India is that it would really like to play a major role in world affairs, but its capacity to do so is limited. If you go to the foreign ministry in India, the first thing that strikes you is that there just are not that many people working on a broad set of issues. They are going to have to generate more capacity in order to deal with big issues in foreign policy. Moving forward, the United States must figure out how to reconcile means and ends. We are resource constrained – we must fix our domestic house, we need to rebuild our infrastructure and our economy. What does that mean for our foreign policy? We cannot do everything in the world. I think we saw a glimpse of that in Libya, when the President said this is something we should be doing, but the British and French should take the lead given that Libya is closer to Europe. That is the kind of thing we’re going to have to be starting to figure out. How do we remain an international leader while shifting some of the burden off to other countries? In that regard, how do we move forward in the world in which there are a number of new, rising powers that want a greater voice in global governance? If you compare the 1990s, the U.S. was the unquestionable superpower – dominant economically, dominant politically, dominant culturally. Really, we could set the agenda for world affairs. And that is going to be increasingly less likely over time. China, India, Brazil, Turkey, all are taking a greater role, wanting a greater voice. How do we manage that? The G20 process is tough to manage if there are many competing voices. What will it mean for the UN Security Council over time? These are difficult questions relating to global government that we haven’t really come to grips with. DC: What about the Middle East and the Arab Spring? JG: The administration has had a difficult time finding its footing here, and how the United States will respond to the issues of the Arab Spring is a pressing issue. We saw some stumbling early on responding to Egypt as protesters gathered, then dealing with long-term allies disappearing as things were dramatically changing within Egypt. What happens in Egypt is crucially important to the region and to American foreign policy, but the United States has not been able to pay enough attention, partly because of the situation in Libya. Thinking more broadly, what would the Arab spring mean for Saudi Arabia? How stable is Saudi Arabia? Instability there will be devastating for American foreign policy. What will we see happen in Iran? Is the Arab Spring a harbinger of what might occur within Iran? Will Iran be able to keep a lid on the Green Movement? Should the United States intervene? Then there is the difficulty and the challenge of having to respond to Syria. There is a growing international consensus that Assad must change course, if not leave office. But how do you make him do that, how do you make him change course? The UN Security Council will not authorize intervention in Syria. The United States does not really want to go into Syria. The tools available are much more limited, and the challenges are enormous. Then, of course, you have the long-standing challenge of the Israeli-Palestinian conflict. Negotiations have been stuck, and negotiations are likely to stay stuck. The challenge of the Israeli-Palestinian issue is largely one of politics of all three places: within Israel, within Palestine, and within the United States. The major challenges are that there were leaders like Hosni Mubarak who provided a level of certainty for American foreign policy. There was a peace deal with Israel; he was committed to that deal, and that provided a certain amount of certainty. Now there is a lot more uncertainty. We don’t know whether the more democratic countries in that region will be more favorable to American interests. We cannot expect all the countries in the region to move in the same direction at the same rate and have the same outcome. I would distinguish between the Arab world and what we saw in Central and Eastern Europe. In Europe after 1989, a set of countries all wanted to join the West, had Western assistance and Western institutions as magnets. Even there you had countries that for a while went in a different direction. Slovakia, Romania, and Bulgaria had a hard time. But for the most part had a direction they wanted to go, and had institutions and assistance for making that happen. In this case you don’t have the same situation. There is not a clear direction, nor a set of institutions or a manifestation of assistance. That is the most important characteristic of the Arab spring. For so long we have talked about universal values, and everyone always wondered, why is there no movement in the Arab world? Why don’t people there seem to want these things? What we have seen over the last year is that, in fact people do want those things. They do want some level of dignity. They do want some voice in their own affairs. They do want more freedom. That is positive. The question is how can we help these people achieve their goals? This interview was originally published in the Diplomatic Courier’s May/June edition.